Call it roots rock, powerpop, Americana, or alt country, even. Whatever it is, Todd Herfinall’s Right Here Now will have you thinking The Traveling Willburys left their playbook in the locker room and somebody picked it up and recorded all the plays inside. As one half of The Meadows, he was responsible for First Nervous Breakdown, one of 2008’s best CDs. With sing-along harmonies that can’t help but make the listener smile and intelligently written lyrics, it was my introduction to Herfindal and his ability to turn a plethora of influences into something completely unique and compelling. With Right Here Now he demonstrates that he and The Meadows were no flash in the pan. “Keeping Me Up Nights” starts things off on the right foot, followed by a classic powerpop piece entitled “She Can Run”, any fan of Byrds-ian guitars and short, catchy pop will love this one. Herfindal pulls a little George Harrison guitar out of his bag of tricks for “Gratitude”, a perfect complement to the mood of the song. My favorite tune on the album is the anthem “Shine, Shine”, a song that channels a 60’s vibe with amazing effectiveness. Perhaps it’s an environmental statement, maybe Herfindal is challenging all of us to step up and be our best. Whatever it is, it’s catchy as all hell and after hearing it just once, it’ll burrow into your subconscious and take up residence. You’ll find yourself humming it’s melody when you least expect it. Other standouts include the title song (which sounds like a Meadows tune he’d been saving for the right time), “Hang The Stars”, “You Might Just Make It”, and “Tomorrow’s An Ocean”. With almost every song comes another highlight. 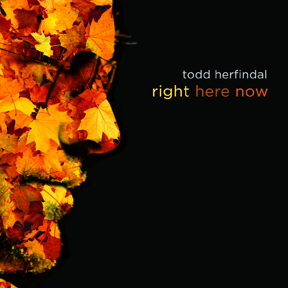 Todd Herfindal’s Right Here Now is clearly among 2013’s best releases.